This 3 day workout is written for someone who is wanting to compete in powerlifting. 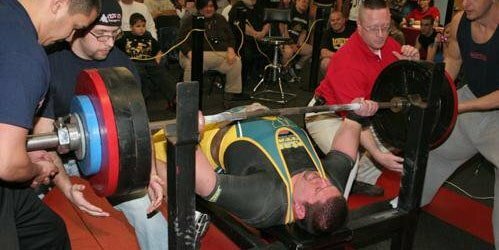 The sport of powerlifting is who can lift the most weight on the bench press, squat, and deadlift. This workout is designed to help you get stronger at these three lifts as well as create a balanced physique. Strive for progression and you will make marked progress. Strength training is actually training your nervous system to produce more power and recruit more muscle fibers. This means that proper recovery is extremely important. Hamstrings are arguably one of the most important muscles to get stronger. Your hamstrings and posterior chain is responsible for how high you can jump, how fast you sprint, and how much weight you can squat and deadlift. Having weak hamstrings and overdeveloped quads lead to knee problems and can prevent you from getting stronger. Good Mornings – Good mornings may sound like a happy name, but this exercise is a monster. Great for developing a strong posterior chain and back. Straight Leg Deadlifts – The trick to straight leg deadlifts is to get a good stretch in your hamstring. Pulling from the floor to your knees is a technical spot and if you have weak hamstrings you will have troubles getting weight off of the floor. Good stretch and contractions is more important than just moving heavy weight. This is to help build your squat and deadlifts so do the exercise right and keep your ego at home. Romanian Deadlifts – Romanian deadlifts are great to get a good stretch in your hamstrings and puts a lot of stress on your whole posterior chain. Glute Hamstring Raise – Most people won’t have a true glute hamstring raise machine, if you do, use them. There are many different exercises that work the quads out. The idea here is to help build your quads for a balanced physique. Front Squat – The front squat is the king of quad development. The reason this exercise is so valuable is because you get the same type of stress and full body workout as a back squat does, but this focuses a lot on quad and core development. Don’t worry about going as heavy as you possibly can right off the bat, this exercise is challenging and work on form and getting good development of your quads. Zercher Squats – Zercher squats are good at quad and core development because the bar is in front of your center of gravity and your quads are used more than hamstrings. Hack Squat – For those who can’t do a front squat due to posture issues such as kyphosis in your thoracic spine and you cannot hold the bar on your delts without choking yourself off, hack squats are the next best thing. If you ‘can’t do’ front squats because it hurts your wrists or hurts your shoulders resting the weight on your delts, man up. Most gyms have a hack squat machine or hack squat sled. Leg Extensions – Doing isolation movements help develop a certain muscle, but does not help develop the movement that you are trying to lift more weight on. Seriously, use this exercise after you’ve tried the other alternatives. Performing these exercises involve massive amounts of strength, proper form, and technique. It can be the difference between a 495 pound deadlift and a 525 pound deadlift so ensuring proper form will help keep you injury free and able to train for years. Always record your sessions and watch where your form breaks down so you can work on fixing it. In regards to form and technique, there are a lot of professional athletes and other guys who lift heavy that give tips and cues for you to follow on these big lifts; listen to them and find what works for you. Recovery is the most important key to progressing and lifting heavier weights. Proper recovery includes a lot of food and a lot of sleep. A person who is stuck on a certain lift is most likely not eating enough. When powerlifting and getting stronger, you must eat a lot to recover and get stronger. This is not a bodybuilding routine, if you really want results you must eat. Start with 300 calories over your baseline and see how you progress from there. Get enough rest. It’s understandable when you have work and family obligations that you can’t get 10 hours of sleep every day. The more sleep you get, the better you are going to recover and the more power you are going to regenerate. If you are serious about becoming a powerlifter, you will skip those Friday and Saturday night parties and focus on your goals of getting stronger. You may see there aren’t many exercises in this workout. If you’ve ever had a heavy max effort squat or deadlift day, you don’t have much left in the tank to keep going; this routine will keep you progressing without burning you up. Accessory lifts that I have not listed such as using chains, bands, partials, overloading, super sets, etc are above and beyond the scope of this program. This program is designed for anyone from beginner to intermediate, and until you start hitting points where your form breaks down bad, you do not need to worry about any accessory lifts. Powerlifters don’t add in exercises that won’t make them better at the three lifts. There is not enough energy to add in 5 sets of curls if there is no payoff to them. Accessory lifts are used to attack different weaknesses that show up under maximal load under the bar. Once again, beyond the scope of this workout. Ab work is great to add in on a couple off days. These heavy compound lifts will work your core, but doing quality core and ab work is going to benefit anyone. Planks, oblique twists, and ab rollouts are some of the most helpful exercises. Be sure to not overdo the ab work, you aren’t going to get abs on this routine. If you are trying to get abs on this routine, it simply won’t work. This routine is a very simple start to a very fun and long journey into powerlifting. Don’t worry about all of the assistance work and specialized programs out there if you are a beginner to intermediate. There is no secret to getting a good strong foundation, so progress and work hard. Don’t try to complicate anything in the routine. If you hit a roadblock, take a week and lift 60% and eat a little more and try again next week. There will be a time where you hit a wall, everyone does. Don’t be afraid to leave a comment or question, I’ll answer them as soon as I can. Be sure to like us on Facebook and share us with your friends if you’ve found this helpful! both workout b and c have Military Press, is this a typo? Thank you for pointing this out. I was tired last night and I wanted to get out the article and damn the copy and paste. Awesome article – keep up the good work. Good luck bud, let me know how it goes! Is there a way that I can add in bodybuilding to this program?. For example do workout a then the next day do a bodybuilding workout then workout b then bodybuilding workout an so on. Or would that effect the rest you need for strength gains? The routine is actually kind of a powerbuilding routine. Most of the strength routines I make are based off of a powerlifting strength with some bodybuilding aspects. This routine will give you mass and give you a great strength base. If you wanted to mod it any I would add in 1 or 2 other exercises for a couple of high rep sets for each day and give it a shot. I know this workout will get you strenght but will it give you mass? I mean Your only hitting one body part seems to me only once a week. It doesnt seem enough to build muscle. You may if your a newbie. Isnt Full body workouts more beneficial so your at least hitting all parts of the body 3 times a week. Such as Squats, Bench Press, Deadlifts or some type of Row, Military Press, and i add in 2 sets of Tricep work and 2 sets of Barbell Curls. This workout is meant almost specifically for someone who is ready to train specifically for powerlifting. They’ve already been doing something like the stronglifts or something that gets them a good foundation built and you work on getting better at these three lifts and getting the muscles needed as accessories stronger. This would not be something I would run if you’re trying to just build muscle and get stronger because like you said it doesn’t really hit much on the muscles, it’s more of a pattern overload so you can get better at the lifts.